Description: App lock is one of the best app protectors which could protect your privacy.It can lock contacts, SMS, e-mail, gallery, settings or any apps by password or pattern lock.With this app, you don't have to worry about your private information on your phone to be exposed to other people, you don't have to worry about your kids messing your phone up by changing the settings. ★lock recent apps : Protect privacy apps from prying eyes . ★Password / pattern lock shift:Change passwords mode , the second option in settings . 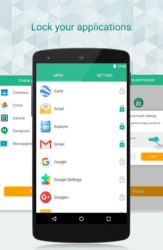 ★App Lock: Secure your Android and protect all your privacy. You can lock individual apps instead of the entire phone. ★Delay to lock: Re-lock is not required when returning from a brief exit, avoiding to frequently unlock and smoothing the app switches. ★Photo Vault:The selected pictures and videos from the album will be hidden, only show in the pictures and videos safe safe. After entering your password, fingerprint or graphics to view, protection of privacy is that simple.